Ready to get all your painting projects done? Now is the time to grab yourself a high-quality handheld spray gun. It will make the job easier and allow you to work anywhere. Don’t spend hours reading all those sprayer reviews. I’ve done all the work for you. Just follow my comprehensive guide and you’ll learn what a handheld sprayer is used for. I’ll also help you learn what to look for and help you find the best handheld airless paint sprayer. What Should Handheld Paint Sprayers Be Used For? 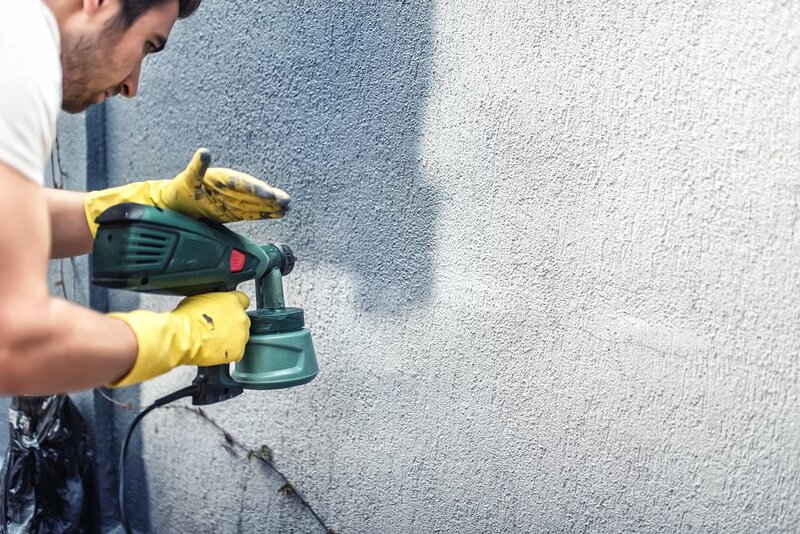 Normally, a spray gun is connected to a source of air such as a compressor. With these small, handheld spray guns, you can enjoy the benefits of portability because you won’t be connected to a compressor. Instead of mixing your liquid with air, high-pressure will push the material out of a nozzle which causes it to spread out and atomize. They are perfect for any job that requires versatility. Consider using a handheld sprayer on your furniture or cabinet jobs. They are also ideal for taking outside and doing deck work or painting your fence. When you are ready to purchase a handheld sprayer, there are several things you want to be aware of. Pay attention to the pump, gun, tip, and hose to ensure they are the right sizes for your projects. Thicker materials will require a bigger tip. If you opt for a smaller one instead, you might battle clogging issues. In addition, stains will require the use of smaller tips sizes while paints will need the larger options. You’ll also want to give consideration to the project size. A larger project will need a broader spray pattern than a smaller project would require. Check out my pick for the best handheld paint sprayers on the market. I cover all the major brands, some airless and HVLP models, along with a battery operated Graco sprayer as well. Read through the handheld paint sprayer reviews and you will quickly see why this is a winner. The patented technology will spray undiluted paint and you can adjust the flow rate for all coating speeds or projects sizes. You can use this sprayer to finish an 8-foot by a 10-foot surface in just 1 to 5 minutes because it will spray up to 8 gallons per hour. The iSpray nozzle is designed without parts that wear so you extend its usable life. It can be used indoors or outdoors ideally for small projects and fine finishing. The Flexio 590 is Wagner’s signature sprayer with thousands of satisfied users all around the world. This model was made with affordability in mind but doesnt comprimise on quality. A solid choice for those wanting to spend a little bit les. The X-Boost turbine generates 3 times the power of the competitors. This sprayer comes with an adjustable spray control to enhance the precision on your projects. You can use three different spray patterns; horizontal, vertical and circular. The brass spray needle and housing will extend the life of the unit and give you an improved performance. This sprayer gives you a job that looks professional but saves tons of money. Spray on your coatings instead and avoid those brush marks. You won’t need any hoses, pumps, or air compressors to use this sprayer. If you choose to, there are additional items you can add on to this product to improve the performance and give you more versatility. Homeright has also recently updated this model with a slightly more expensive version called the Homeright Max Extra. The extra $30 in cost will get you plenty more features including more power, more tip options, and wider spraying capacity. Well worth the additional cost in my opinion and superb for use on furniture. Homeright also has an accompanying spray shelter that comes in 2 sizes. It is a great accessory when spraying furniture. Check it out here. This set allows for the use of three spray patterns and three nozzle sizes for maximum versatility. The adjustable valve knobs will allow for you to adjust the flow rate. Use this gun on car parts, home appliances, furniture, and more. A detachable canister allows you to directly add your paint and clean it easily when you are finished. The package will include a spray gun, canister, funnel, cleaning needle, cleaning brush, two gaskets, three spray nozzles, user manual and a full 24-month warranty. The tacklife is a newer model on the market and is another great buy for its very cheap price. For maximum power, this unit comes with a DEWALT XR Lithium Ion System to provide an airless finish at any speed. You won’t need to thin your materials because this machine comes with the Triax Triple Piston Pump with ProConnect. You’ll also enjoy the RAC X FFLP Spray tips that come with your sprayer. Use this Graco model for every small interior or exterior project for the ultimate in portability. Now, you won’t have to fire up your large sprayer to complete a small job. Another newer model, this battery-powered Graco has set the bar high when it comes to cordless machines. It runs smoothly and continuously, lasts very well between charging and is easily the best cordless model around. With this Wagner model, you can use the replaceable filters to keep particles out of the paint. The variable flow trigger is great for controlling the paint flow. Use the included 1 ½-quart cup for larger projects. The Lock-N-Go technology included with this sprayer allows for quick material change. This paint sprayer is ideal for working indoors or outdoors. You can use it for stains, sealers, and other light bodied materials with maximum control and low overspray. Choose from three patterns for the ultimate finish; vertical, horizontal and round. May not provide the quality spray for auto jobs like the other models. Quality doesn’t compare to the higher priced models. This is a powerful 400-watt all-in-one handheld sprayer that is ideal for projects indoor or outdoor. It offers the user three patterns; vertical fan, horizontal fan and round. This PaintWIZ can spray stains, sealers, and other thin materials while still offering maximum control and reduced overspray. When you need to get a job done fast, this unit will paint three times faster than using brushes or rollers. Included in the package are a 1.3-liter cup, additional nozzle, viscosity cup, paint strainers and even a cleaning brush. Once you start using this set, you’ll want to find other things to paint. Use this unit with the EZ Tilt flexible suction tube to spray at any angle. The Optimus dual tip technology provides even coverage and complete control. The 1-quart cup twists onto lock in place and you’ll be able to spray up, down or sideways. The sure prime valve retains your material in the sprayer so you don’t need to re-prime when you refill the unit. Take this sprayer anywhere as it offers amazing portability for a variety of jobs. No matter what you are working on, you can use the paint and stain selector to get the job done right. This paint sprayer is ideal for 4-8 quart projects like the doors, furniture, and decks. It can be used with heavy latex and acrylics. There is no thinning required with this gun. The Tilt-N-Spray pendulum suction tube will provide you with a full motion of spraying whether you use it up and down or sideways. This sprayer includes a 515 TrueCoat reversible tip, 32 oz. cup with cover, 5 liners, pump armor storage/start-up tool, instructional DVD, and storage case. The Truecoat Pro II is the culmination of Graco’s technology and experience in machinery. Even being a handheld machine it can spray surfaces at the efficiency of a larger airless spray gun. If I had to choose one gun for smaller home painting jobs then this is the one. No matter what job you have to paint, I think it has now become obvious that there is a sprayer that is right for you. By looking through my handheld paint sprayer reviews, you should be able to pick yourself the best handheld airless paint sprayer available. All that is left to do is complete those jobs!